When using the excel datasource one might run into issues using the preview of the datasource when the worksheet inside the excel workbook holds a spae in the name. 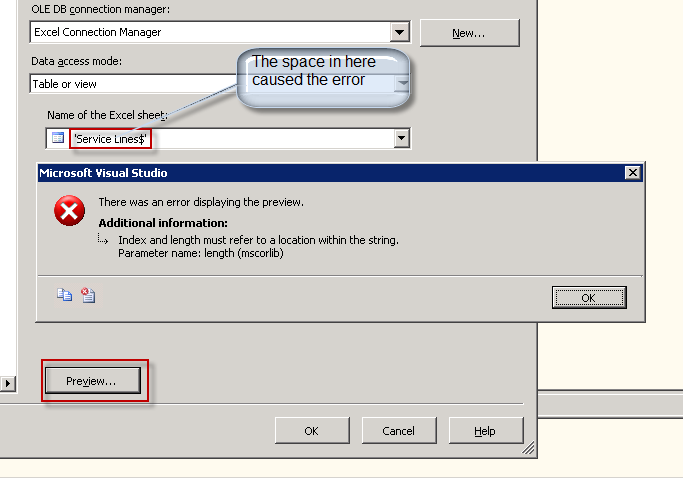 This error however will only appear when clicking the preview button, the package itself will execute just fine. This entry was posted on Monday, December 21st, 2009 at 21:23	and tagged with Excel, preview button and posted in SSIS. You can follow any responses to this entry through the RSS 2.0 feed. I’m so in a position to check out this page. This can be the form of manual that needs to be given without the accidental misinformation that’s along the other blogs. Appreciate sharing this best doc.